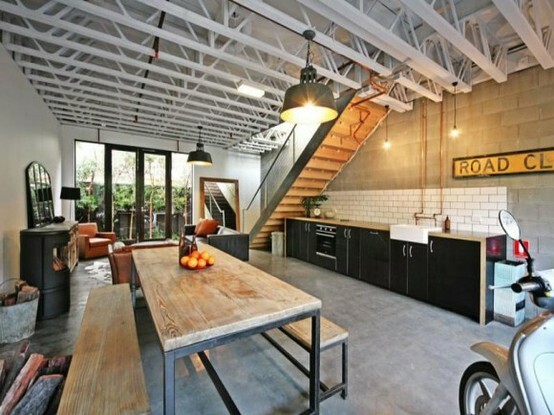 I bet everybody knows what industrial style is. 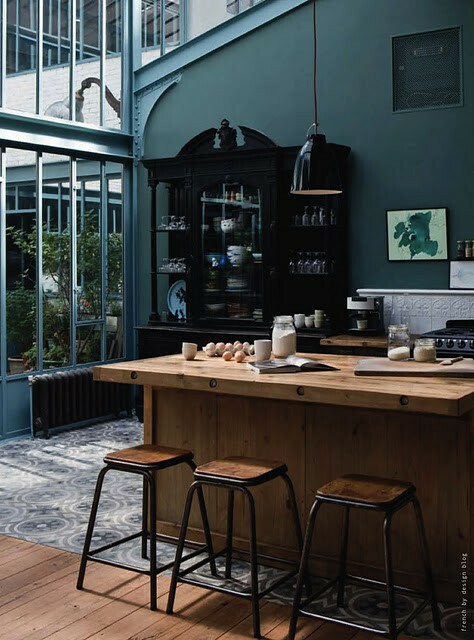 It’s a quite aesthetically pleasing yet not the most popular trend in kitchen design. 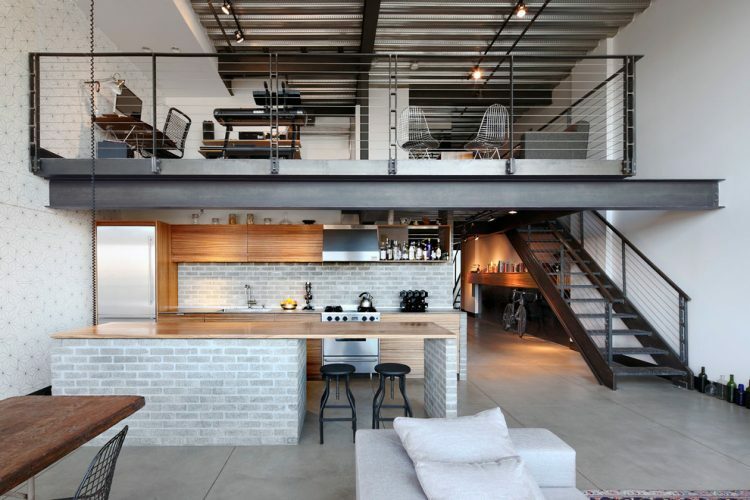 It takes clues from old industrial spaces that are converted into living spaces. 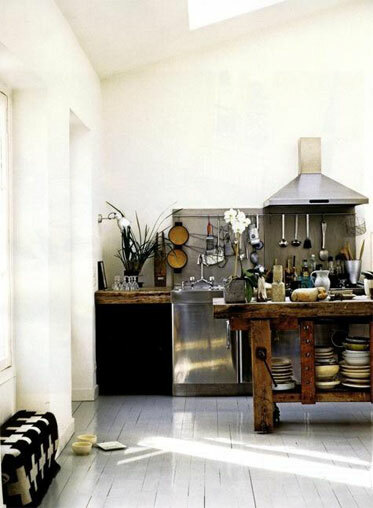 That as simplify the process of designing a kitchen as make it harder. 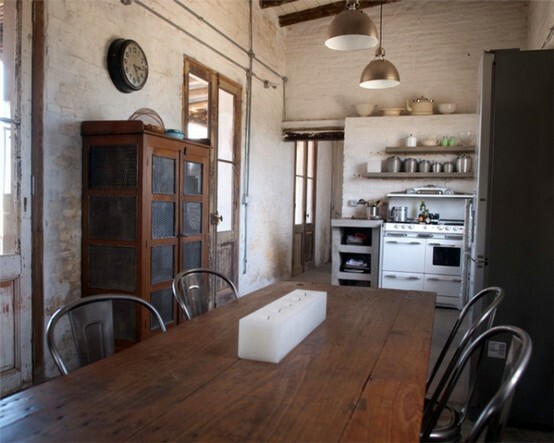 The cool thing that you can leave such things as brick walls, concrete floors, weathered wood, ventilation pipes, and aging metal exposed. 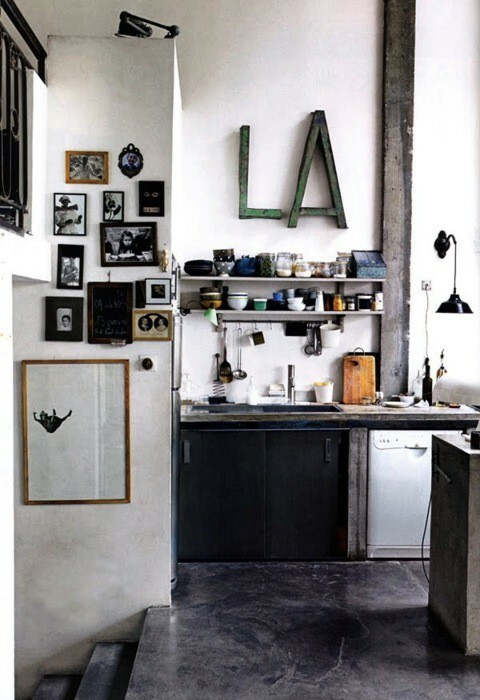 If you don’t have these things in your interior it might be a complicated task to fake them right. Although there are plenty of tutorials nowadays showing how you can do that. 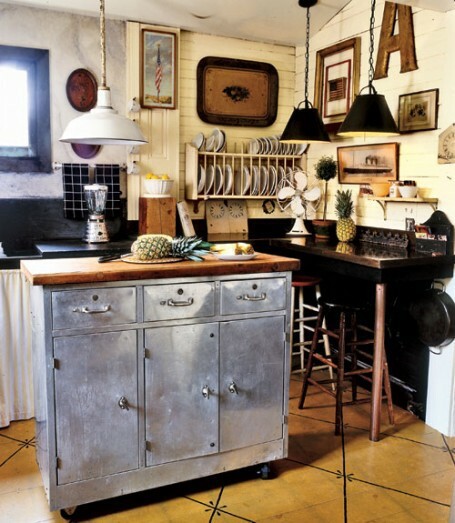 Retro-looking appliances. 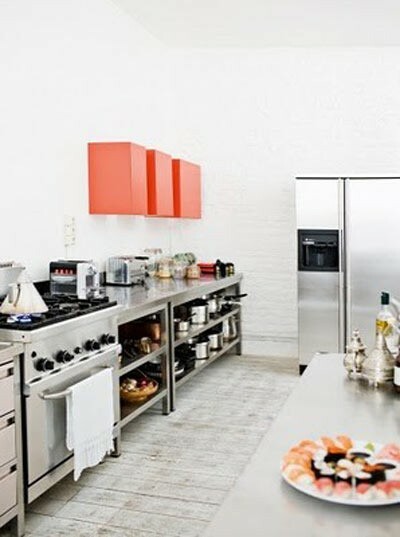 SMEG’s fridges is a great example of such appliances. 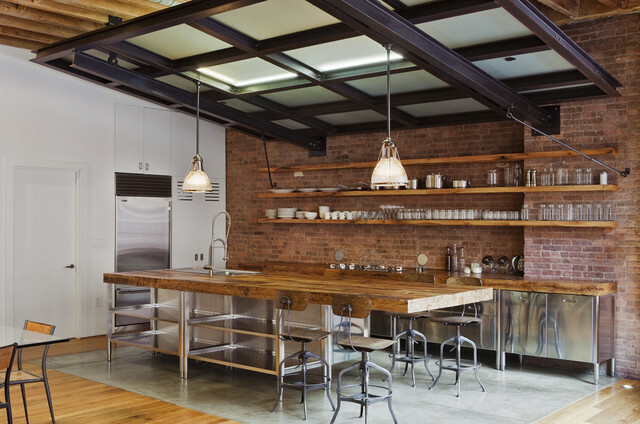 Industrial light fixtures. There are plenty of good options you can buy nowadays. Even at IKEA you can find several good pieces. 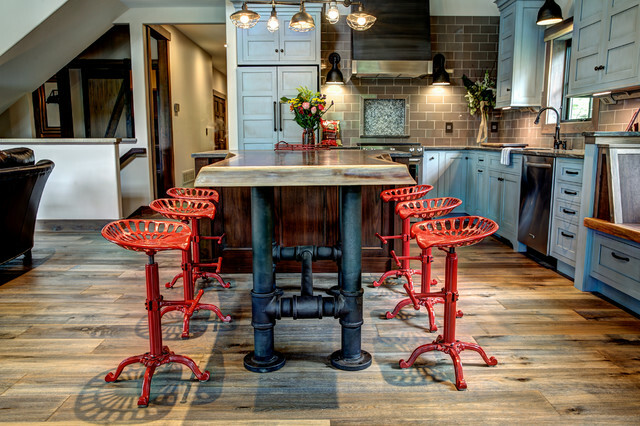 Industrial kitchen island. 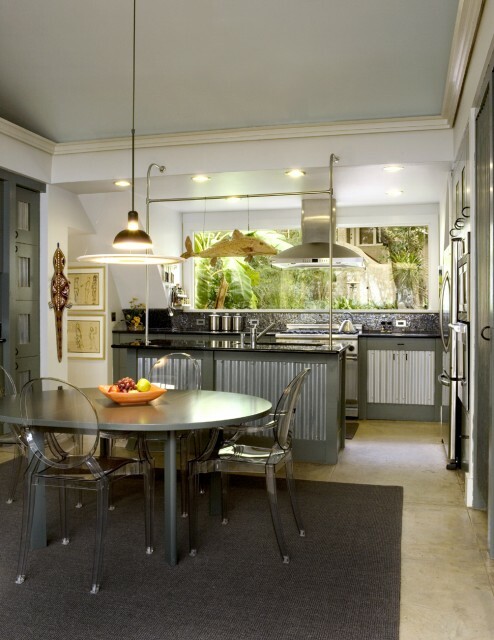 There are plety of ways to design such island. You can even upgrade the one you have already. 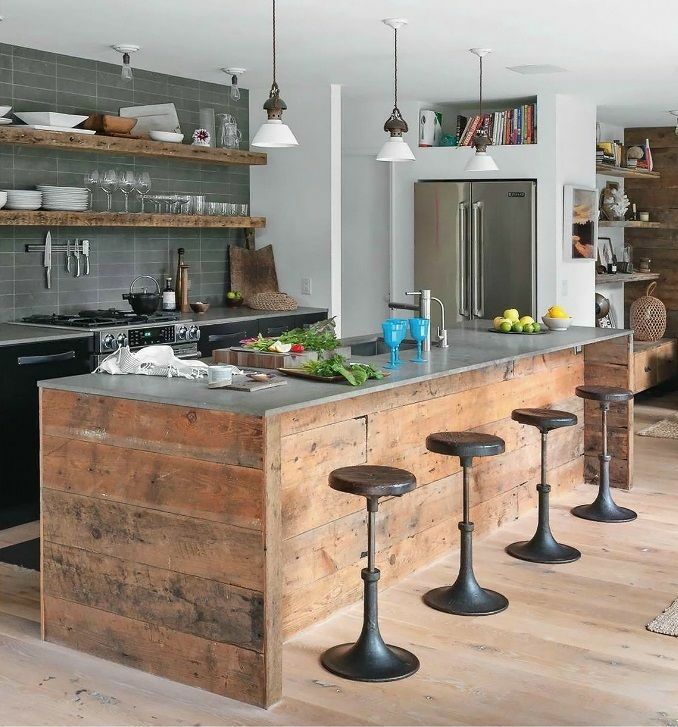 The most popular way is to cover its sides with rustic wood planks. 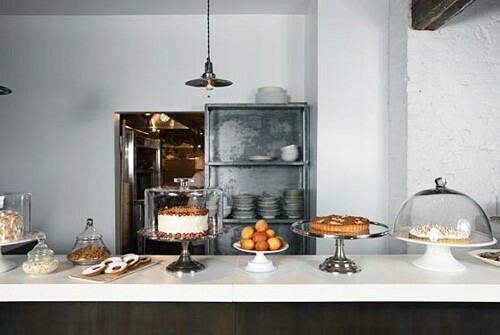 Although you won’t be disappointed if you go with the concrete one. 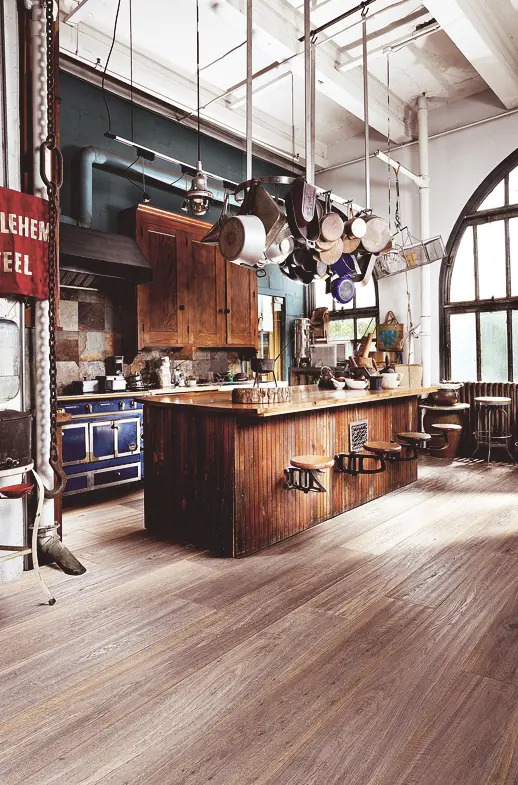 Industrial kitchen faucet. There aren’t many models you can buy nowadays. 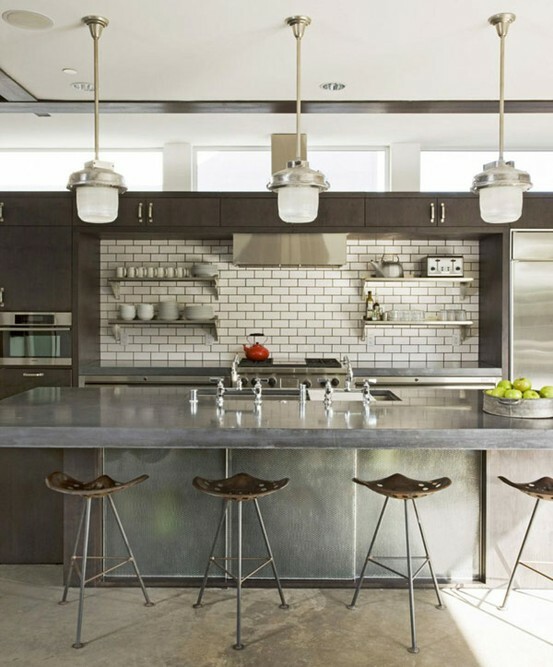 Although Kohler has some beautiful modern faucets that can fit your kitchen well. They are also quite flexible and practical. 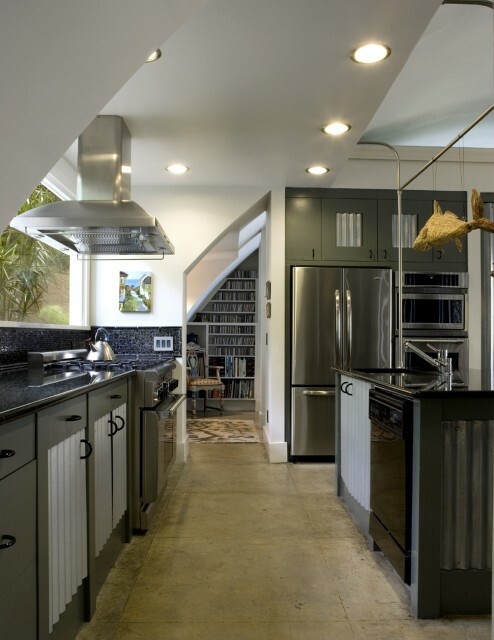 Use bare metal pipes. There are plenty of things you can do with them. 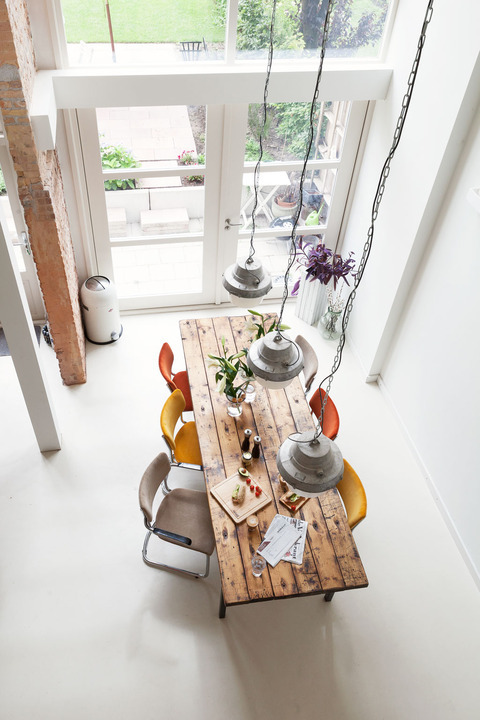 You can use they as support for shelves, as railings, as part of light fixtures and so on. 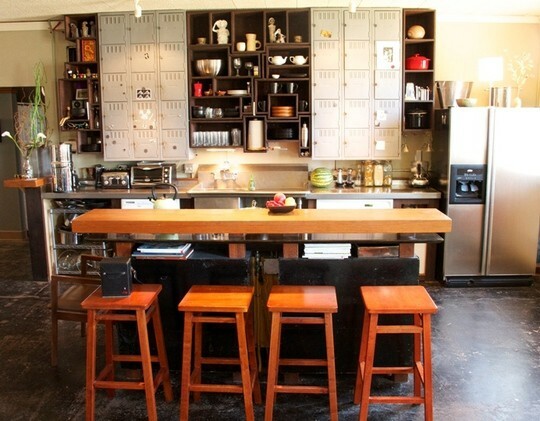 A lot of decor and storage problems could be solved with them. 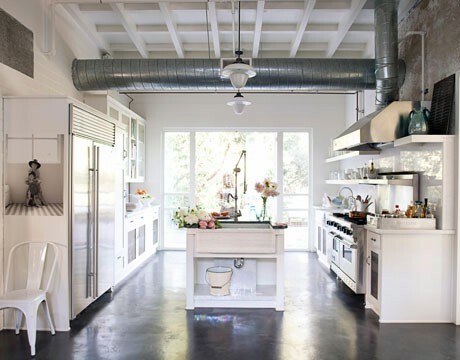 Use commercial range appliances. 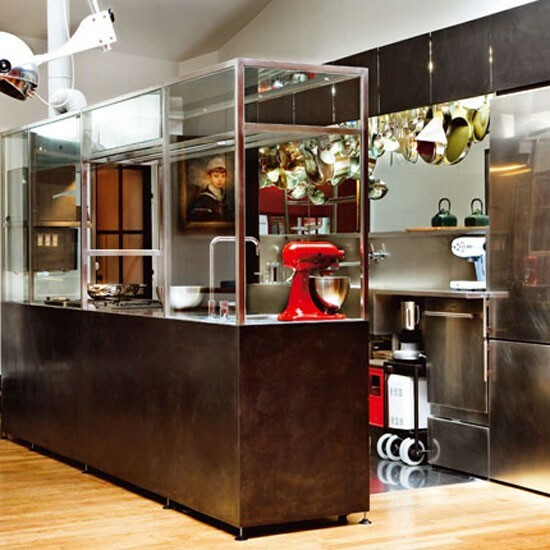 Large cooking hoods and stoves fit really well into industrial kitchens. 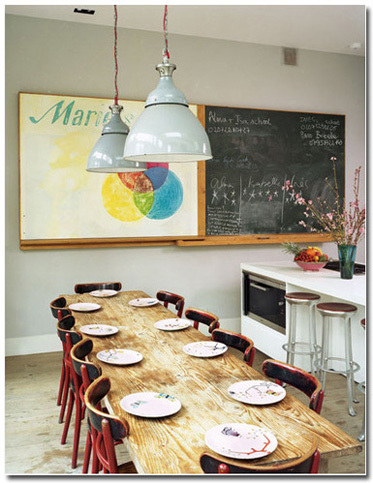 Besides an island you should definitely consider a rustic table and several vintage chairs. 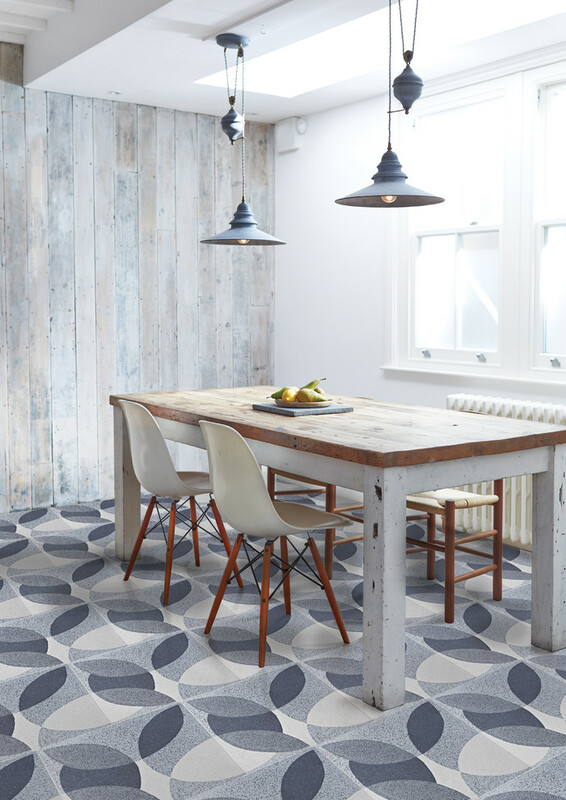 They could also become a great focal point. Different stationary and mobile carts also work well and could serve several purposes at once. 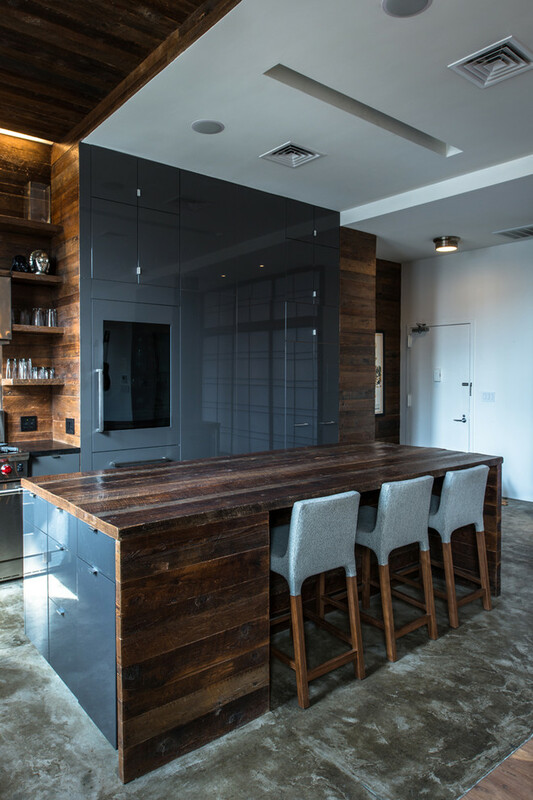 As for the cabinets, with the right surroundings you can go with very modern, sleek, glossy cabinets and your kitchen would look great. 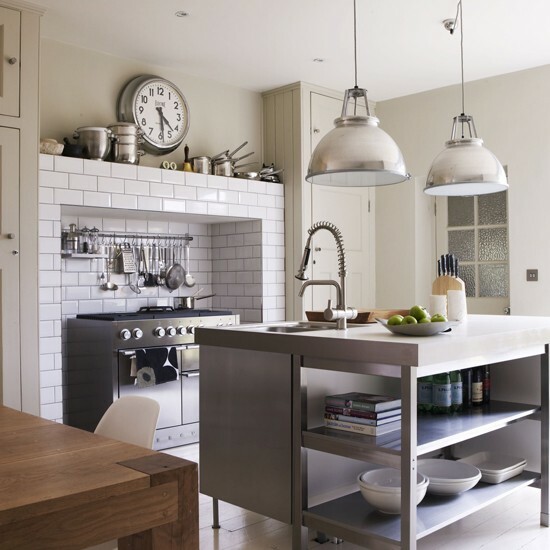 Although stainless steel cabinets is also an option to consider. 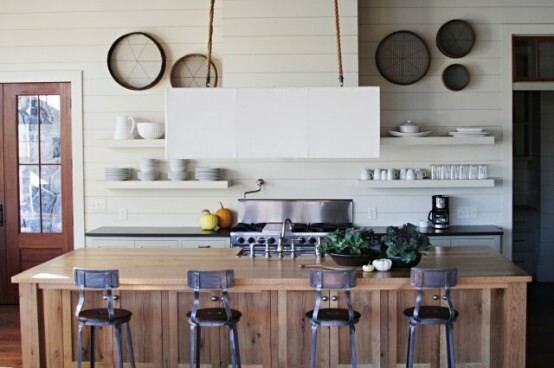 Btw, don’t forget to add a bunch of rustic floating shelves. 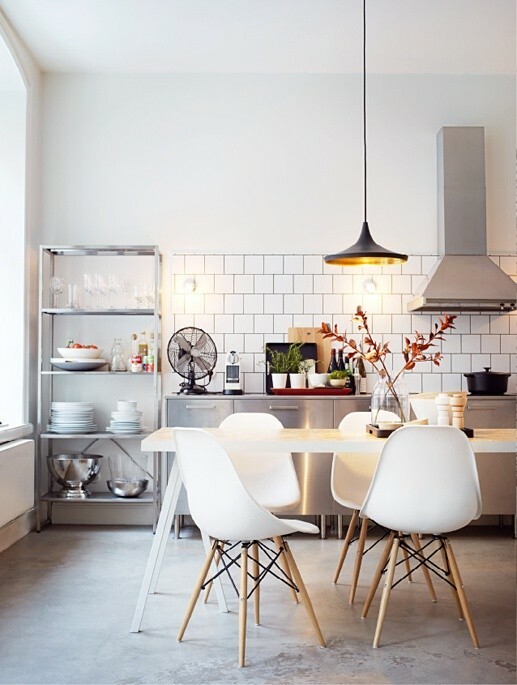 They add a cozy touch to any kitchen. 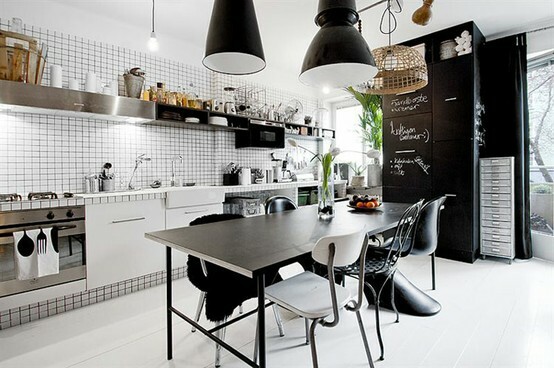 Modern black and white twist on an industrial look. 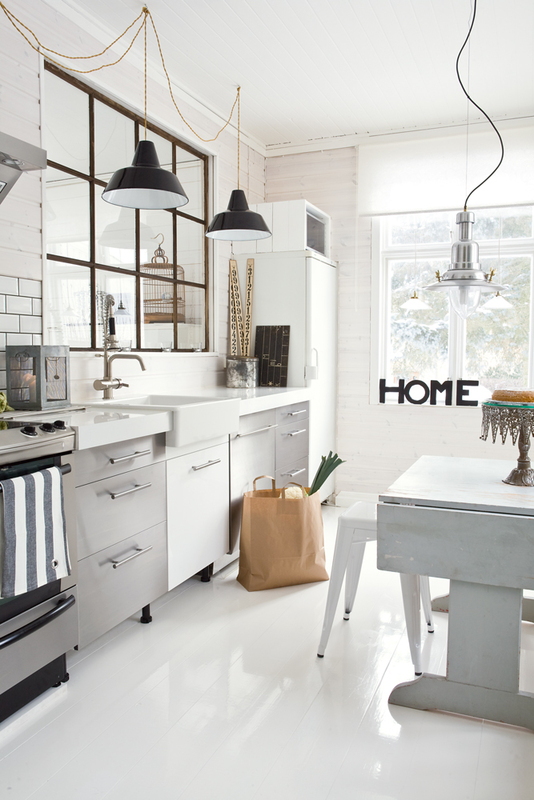 Lovely kitchen from IKEA with several decor elements that adds an industrial feel. 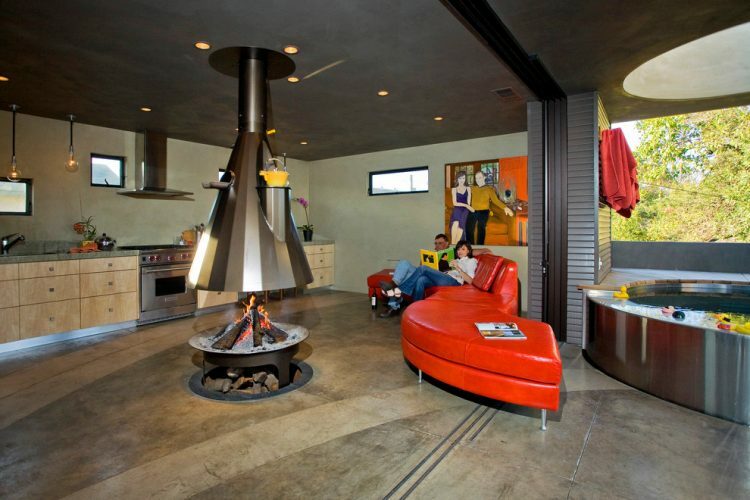 One of the most popular industrial design elements is leaving architecture elements uncovered. 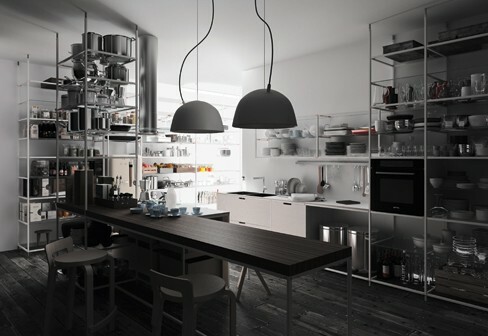 All-metal open shelving is one of those things you could add. 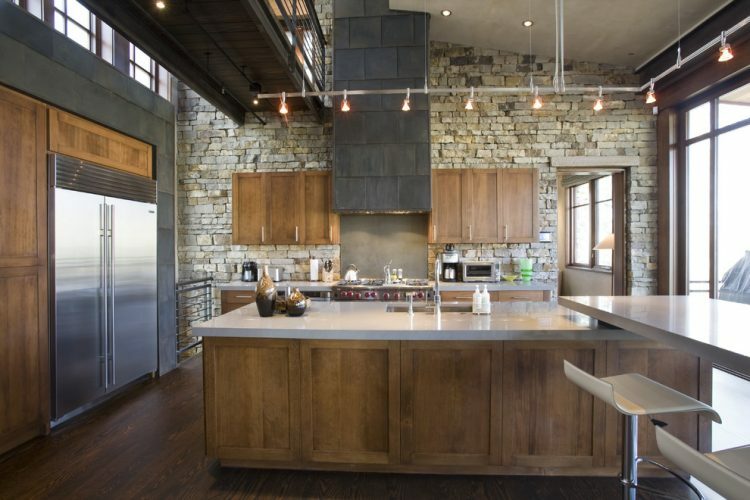 Rustic doors and rustic kitchen island looks great together. 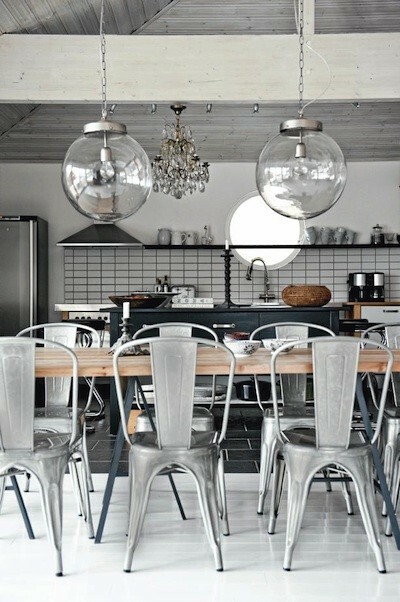 Pendant lights are awesome when they come in a large group. 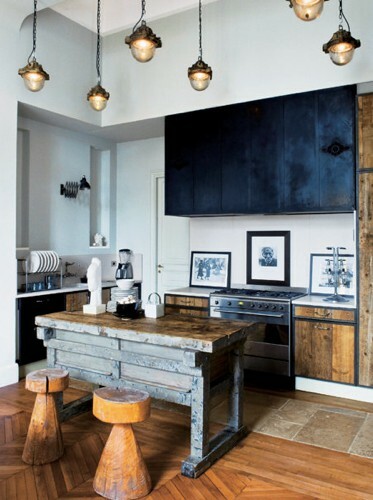 Metal surfaces and industrial pendant lights with long black cords looks great together. 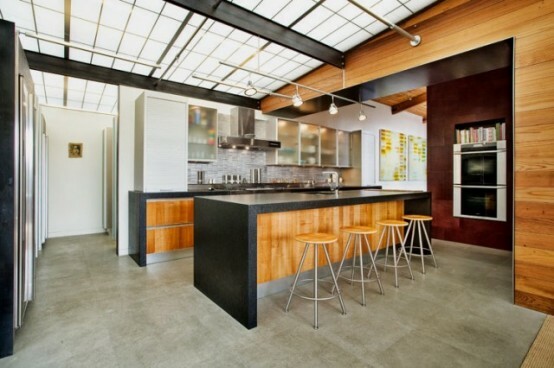 Rough surfaces and hight ceilings make this kitchen looks like it's located on some manufacturing facility. 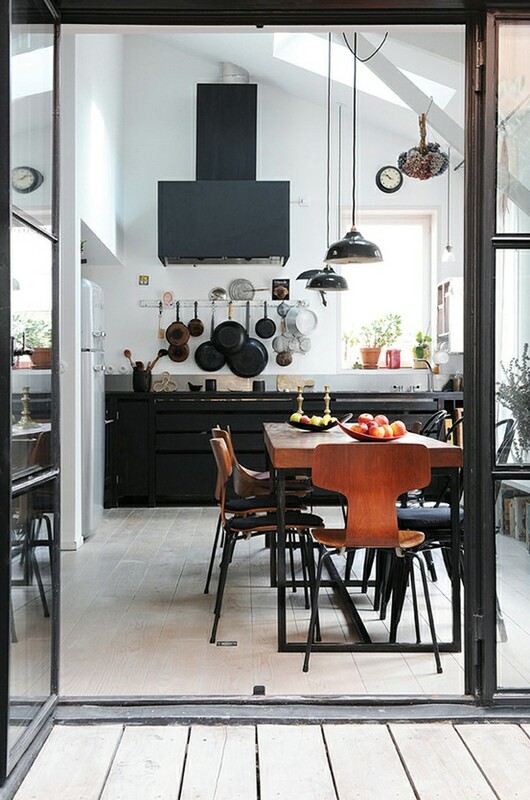 Warm wood mid-century chairs and black kitchen cabinets, black cooking hood and black pendant lights create an interesting atmosphere on this awesome kitchen. 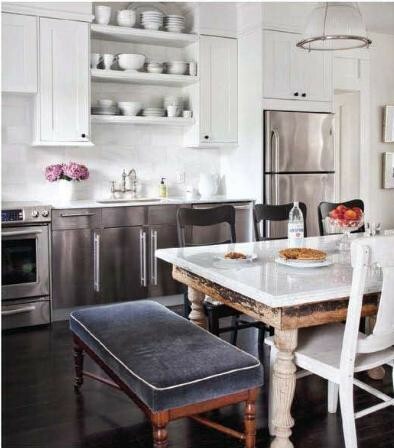 An amazing vintage metal chairs and glass orbs above them are things that make this kitchen special. 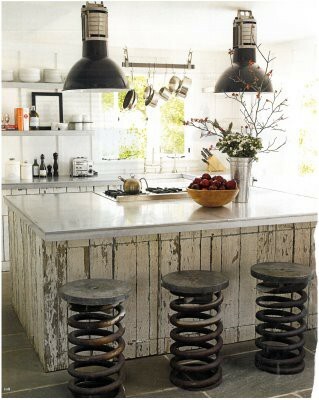 An unusual locker-style upper-cabinets is a focal point of this kitchen. 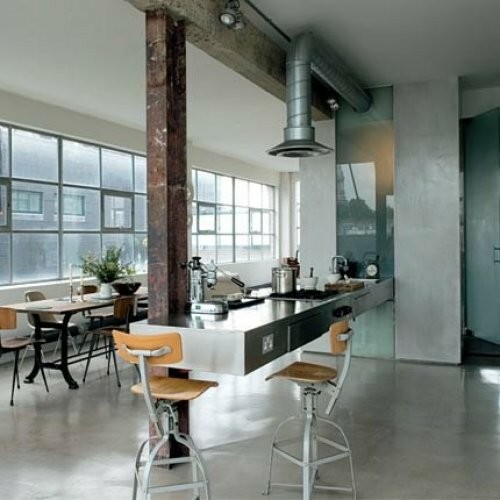 Bare concrete walls and ceilings is one of those things you can often find in industrial kitchens. 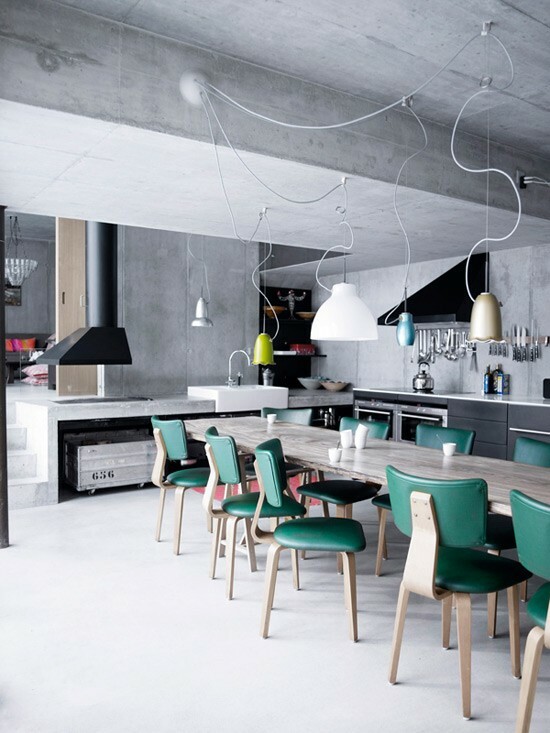 On this kitchen creative light fixture and emerald chairs add a color splash concrete need. 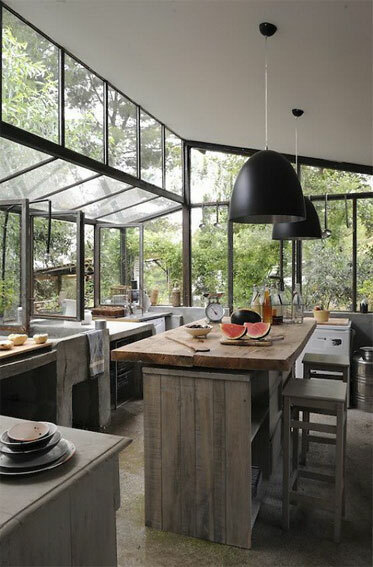 Floor to ceiling windows on this kitchen fill it with natural light. 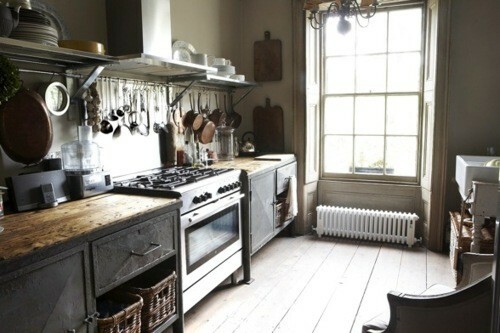 Cooking there must be a pleasure. 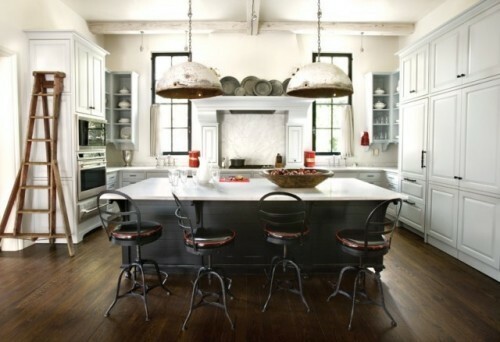 If you want a reustarant-like kitchen at home then here is a great example for you. Overhead pot storage is great if your collection is made of copper. 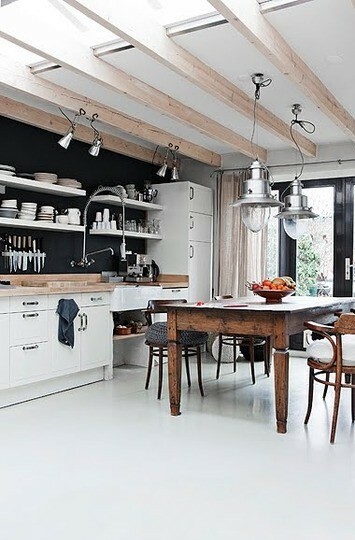 Natural rustic wood, vintage shelving and black walls looks great together on this cozy kitchen. 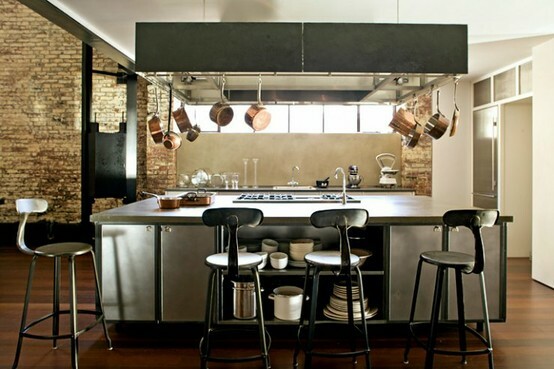 Busy but industrial-inspired kitchen design. Everything is on hand here. 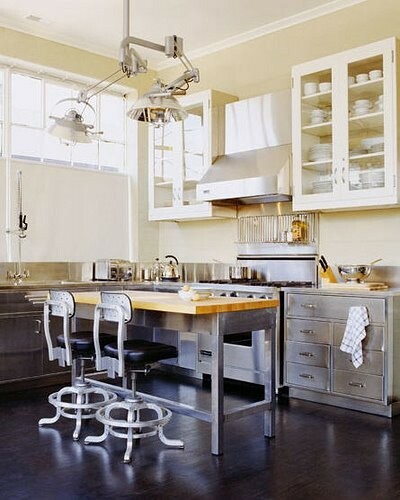 Modern take on industrial style kitchen design where metal surfaces are stainless steel. It's really practical. 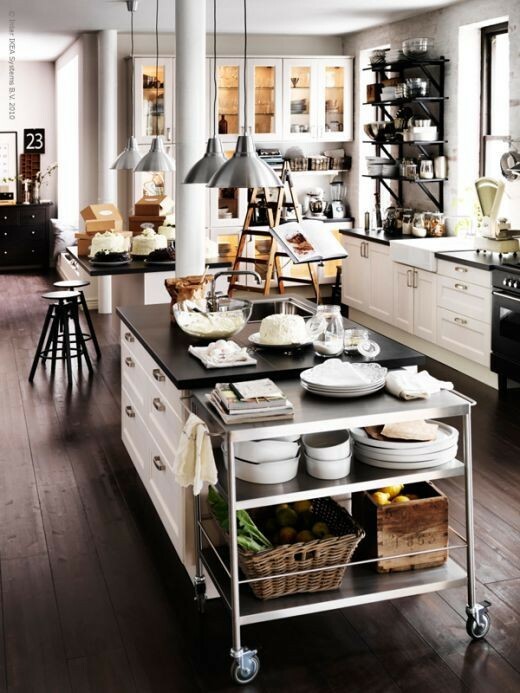 Vintage industrial style kitchen island is an awesome centerpiece for any kitchen. 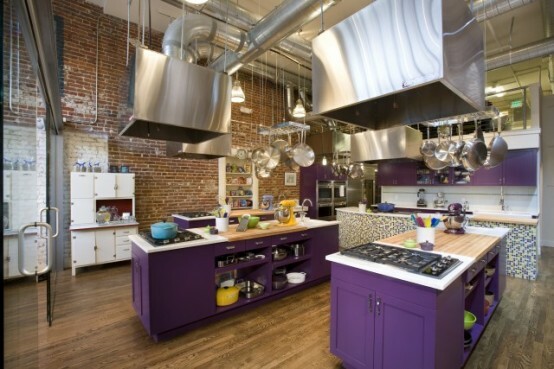 Who said a industrial kitchen can't feature colorful appliances? 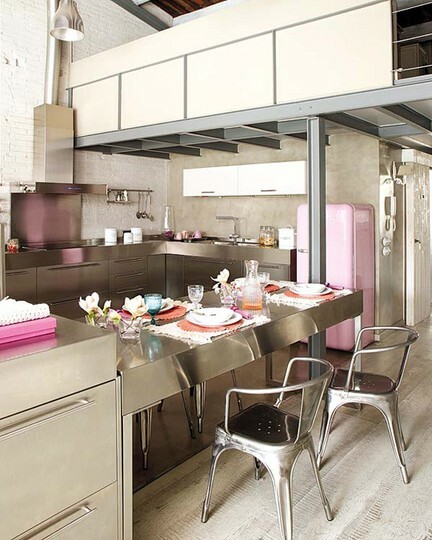 A pink SMEG fridge looks amazing on this one. 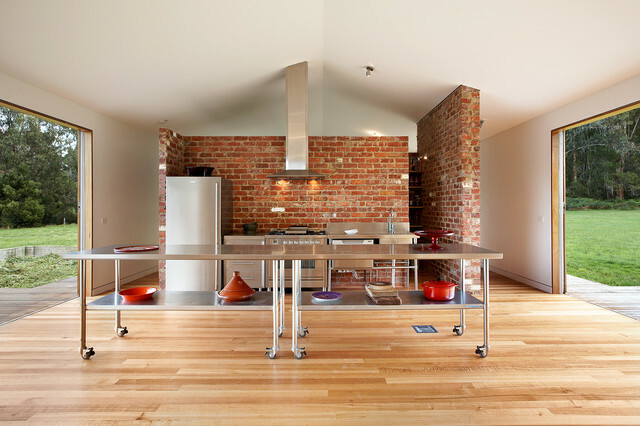 Railing for kitchen utensils and copper pots is more than welcome on a smart industrial kitchen. 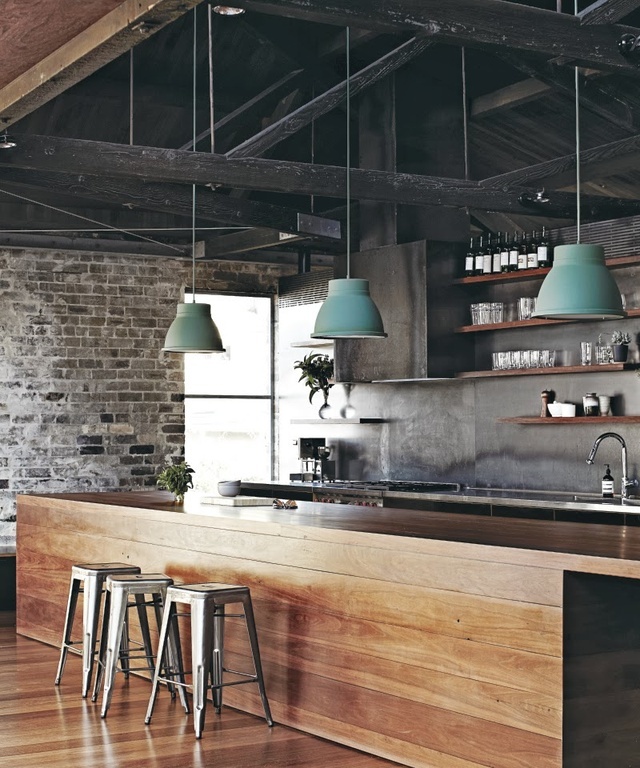 Industrial lamps are those things that are more than welcome in many interiors. 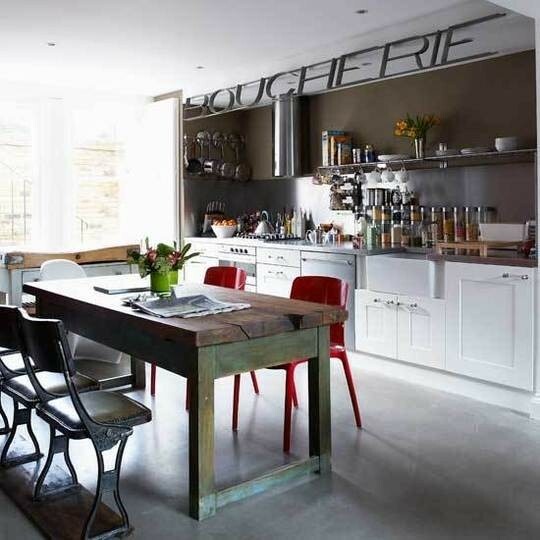 Lovely vintage chairs look great on this kitchen too. 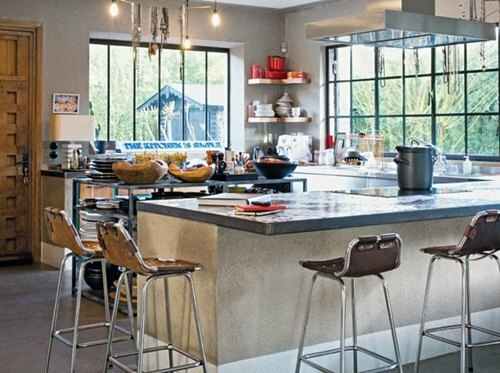 Timeless white kitchen cabinets combined with red chairs and a weathered barn-like dining table make this kitchen look unbelievably good. 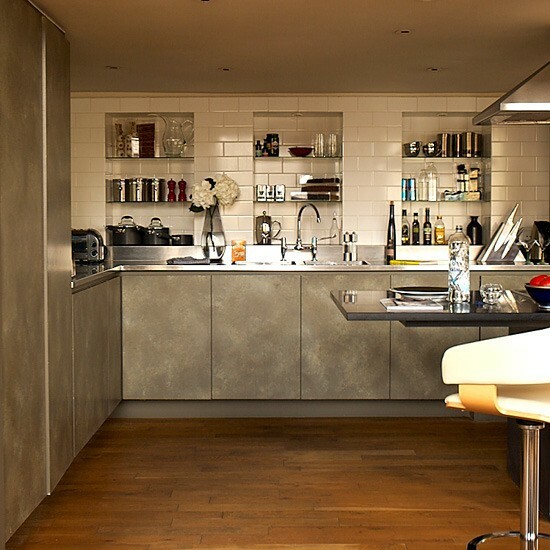 Kitchen cabinets that reminds faux concrete is an interesting alternative to bare concrete walls.